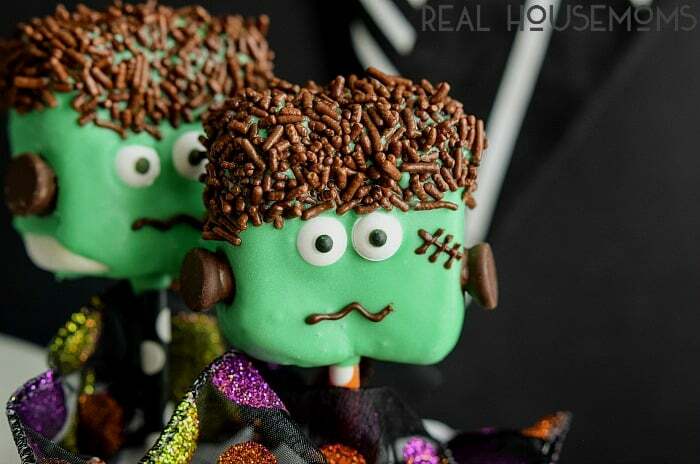 These cute FRANKENSTEIN MARSHMALLOW POPS are an easy Halloween dessert that the kids will love! I absolutely love Halloween! As soon as the weather starts to get cooler and the leaves being to turn I start looking for fun, spooky, Halloween decor and recipe ideas. I have so many Halloween decorations at this point that I get dirty looks when I bring something new through the door so this year I’m trying to focus more on the recipe part, LOL. I think Halloween is so fun because it is for kids of all ages (including us overgrown kids) and there is such a wide range of way you can celebrate from beautiful Day of the Dead parties, to super scary, to cute and fun. Since my kiddos are still a little to young for super scary we go for cute and fun. The dogs gets costumes, we cut out funny faces on our pumpkins and I always make a few Halloween desserts that I know the kids and their friends will love. 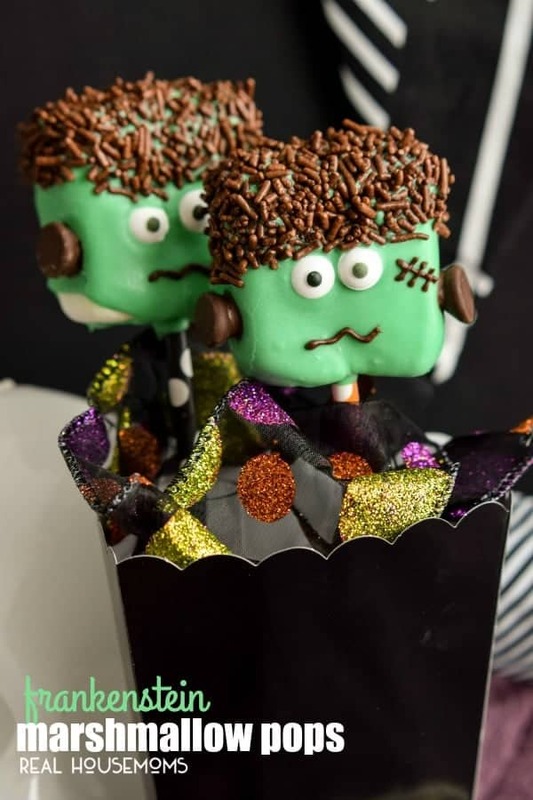 This year I’m making monster marshmallow pops and these adorable Frankenstein Marshmallow Pops are on the menu. I’m telling you I almost couldn’t eat them because they are so cute! Luckily my kids didn’t have that problem :). I know you’re looking at these and thinking they are going to be way too much work but I promise you they’re really easy. 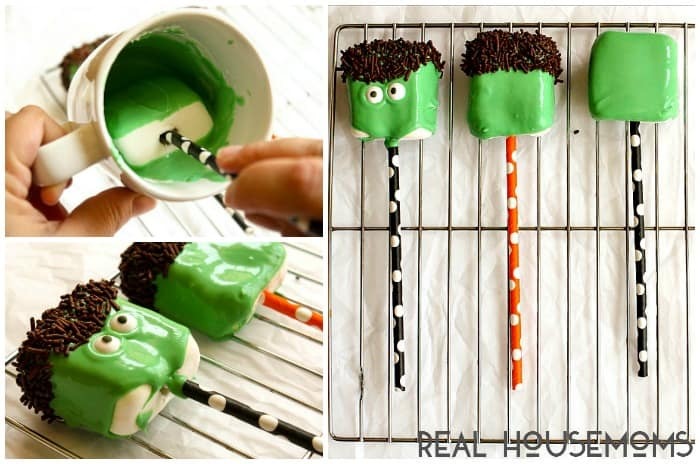 Start with some thick, flat marshmallows and put them on Halloween colored straws. Fill a small bowl with chocolate sprinkles and have some candy eyes ready. Melt green candy melts in a coffee mug and dip the marshmallows into it coating the marshmallow. Tap the straw gently against the side of the cup to get the excess chocolate off. Next dip the marshmallow in the cup of chocolate sprinkles giving your Frankenstein some hair and press two candy eyes onto his face. Once that is done you can lay them on a cooling rack or directly on some parchment paper to let them dry. While the green chocolate firms up take some chocolate chips and melt them in the microwave and pour the chocolate into a sandwich baggie. Snip off a tip of one of the corner and use the chocolate to pipe on a little smile and maybe a few stitches. Add a drop of chocolate on each side and press a large chocolate chip into each side with the point facing into the marshmallow and the flat side facing out. 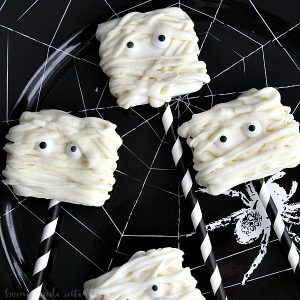 When you’re done you’ll have a bunch of googly-eyed Frankensteins ready to be gobbled up by hungry kids! 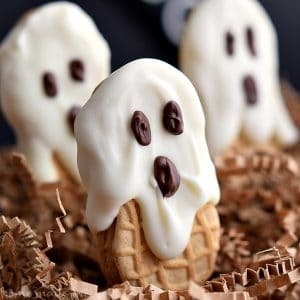 Looking for more easy Halloween desserts? Try these!